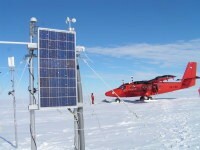 From scientific loggers in the depths of Antarctica, to navigation aids at sea and everything in between, solar panels are the ideal solution for powering remote automated equipment. With no moving parts, there is little to go wrong, so solar installations can be very dependable and require very little in the way of maintenance. No need to lay costly power cables, ultra-low voltages mean they can be quickly and easily installed by the layman. The simplest installation comprises a suitable solar panel, a regulator, battery bank, and the equipment to be powered. Clearly, it is important to size the panel and battery bank so that sufficient power is always available to run your equipment. As a rule of thumb, in the UK the rated power of the solar panels should be at least a factor 20 higher than the power consumption of the equipment. That may seem a lot, but remember that solar panels only generate power when the sun shines. In winter, there may be only 6-8 hours of sunlight per day, and much of that is when the sun is low on the horizon. If your installation is for lower latitudes, you may get away with a smaller panel. Further away from the equator, you'll need a bigger panel for winter power (though smaller if you only need it in the summer! ), and it may be worth considering using a wind turbine as well. As panels in remote installations are almost invariably fixed, and do not move through the day to track the sun, the panels very rarely get to work at full capacity, even when the sun is shining. It's wise to have a battery bank capacity that is (in Ah) approximately 200x the current draw of your equipment (in A). That should see you through a few cloudy days without running the battery down completely. For example, if your equipment runs on 12 volts and on average, draws 1 amp, giving a power consumption of 12 Watts, a 200Ah battery would be appropriate, powered by 240 Watts of solar panels. Many devices that are powered remotely require far less power than this, or only run intermittently, and so a typical installation would be rather smaller than this example. If our 12V, 1A device had a duty cycle such that it was only on 10% of the time, a 20Ah battery and 24W solar panel would probably suffice. If you're unsure, go for a bigger panel and a bigger battery - you can't have too much capacity, and the extra cost will be well worth the peace of mind, knowing that your equipment won't fail in the middle of winter! A robust, framed solar panel such as one of the BP Solar crystalline range of panels, or the Spectraflex amorphous range, is normally the best choice for remote automated systems. They should be mounted to catch the maximum winter sunlight - facing south (in the northern hemisphere at least!) and angled at roughly 60 degrees from the horizontal for British latitudes. Wind turbines can often be integrated into remote power systems to provide additional power, especially during the winter. The Forgenrange are well suited to these applications. Although they do not have a high power output, they are extremely reliable. The standard models are suitable for marine environments, and they are also available in polar-rated versions.